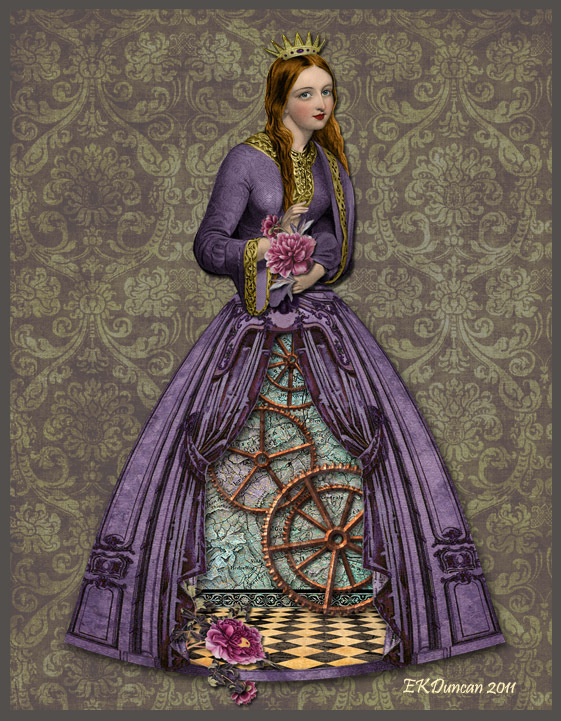 I've been having a blast playing with my PaperWhimsy images and have a new piece of digital art to share. To be honest - I was working on a St. Patrick's Day project but it went a bit off kilter, so with a bit of tinkering; I dropped the St. Patrick's theme and just focused on the Steampunk aspect. The end result was my Steampunk Queen on Stage. I find it interesting how sometimes when you've made an artistic mistake and then find a creative solution to fixing the problem; the end result is actually a better piece of artwork. For me this would be one of those instances and in the process I was able to create two pieces of art. The one I'm showing in this post and then I'll post my other creation in a few days. I'll even share what the artwork started out to be, how I changed it in Photoshop, and some alternate endings. Please keep in mind that I'm new to working with Photoshop and that there are may ways to create effects in that program. I'm just showing the journey I took to create my staged scene. I hope you enjoy viewing my latest artistic quest! 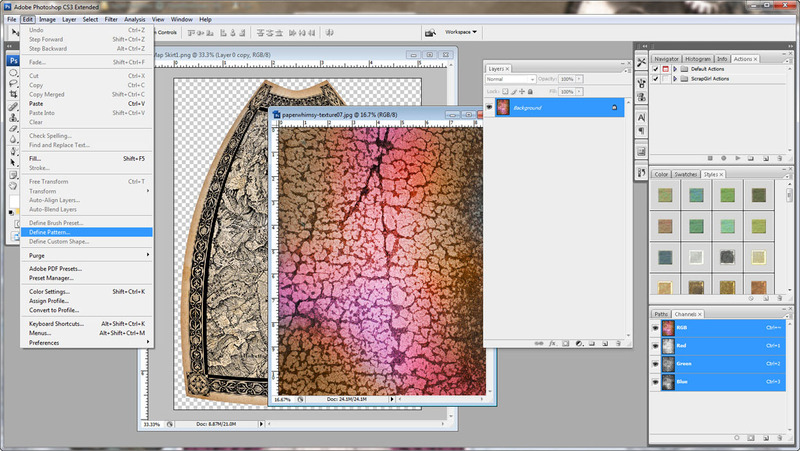 and layer upon layer of modifications and alterations in Photoshop. Here is a close up view of my Queen and her Steampunk gears. and you get to see how it works. In this case "the works" are part of the art. 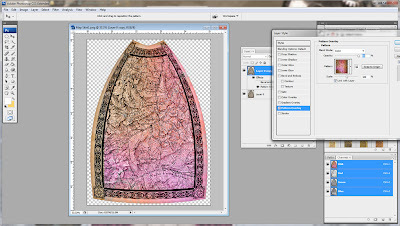 The skirt was created by using the "warp" function in Photoshop. The floor in the skirt and on the stage was done by using the "warp" and "smooshing"
I've altered the color and reduced it's intensity. TIP - Don't rule out purchasing an item due to it's color. 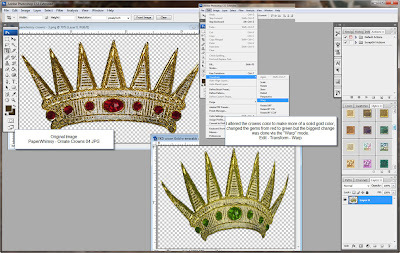 There are a variety of ways to alter the color of an item digitally. 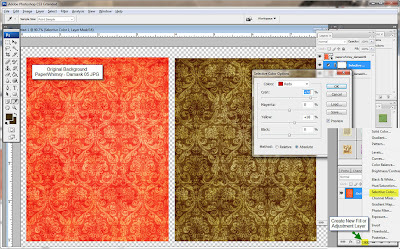 I loved this Damask pattern and its vintage feel but I needed a more muted color. Here is how I choose to give it a different. A few clicks of the mouse later I had the background I wanted. 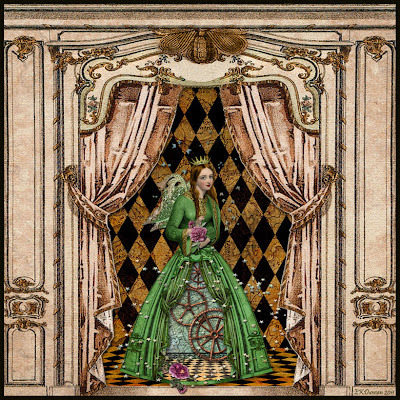 Here are the PaperWhimsy digital images I used. I digitally altered her garment in a few ways and changed her hair color. 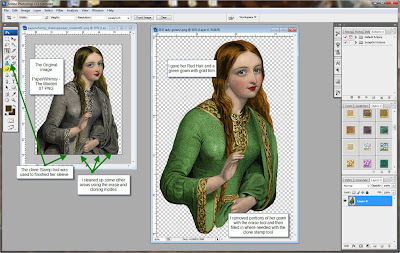 Via the magic of Photoshop I erased, cloned and colored this fair maiden the way I needed her. I was able to finish off her sleeve, remove portions of her garment that were not needed as well as change her hair and clothing color. so that was how I originally created her. I altered the color and removed the tassel embellishment in Photoshop. - For the stage: I made it wider via the Edit - Free Transform mode. I used the bottom crown with a bit of customization. A bit of color alteration and then "Warp" was used to re-shape the crown. Edit - Transform - Warp...a bit of time and I have an new look. 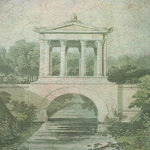 This was used for the stage background and floor as well as for the floor in the skirt. 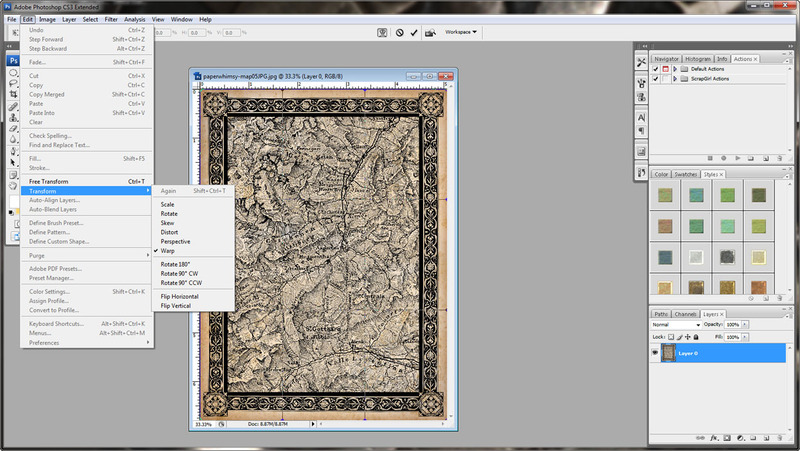 The both floors were done by "smooshing" and "warp"
The map (listed below) was the top layer and set for 33% opacity. 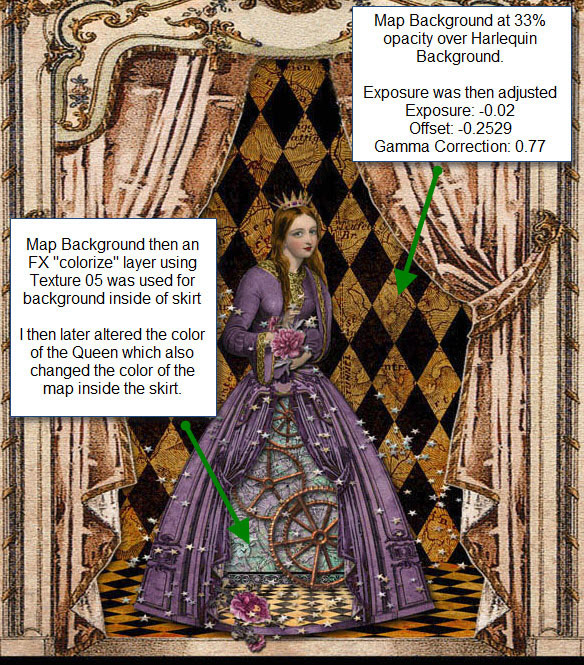 It was also the stage background in the Queen's skirt. I saved this background into my patterns pallet. stage background inside the Queens skirt. I used several cogs in the skirt scene. overlayed some on top of others then rotated them around a bit. I added drop shadow in the FX screen to give them a bit more depth. looked like it was laying flatter on the floor than the original. I also added a bud from Botanique 14 listed above. I used the lower section of stars and rotated them. I just had too much going on here. 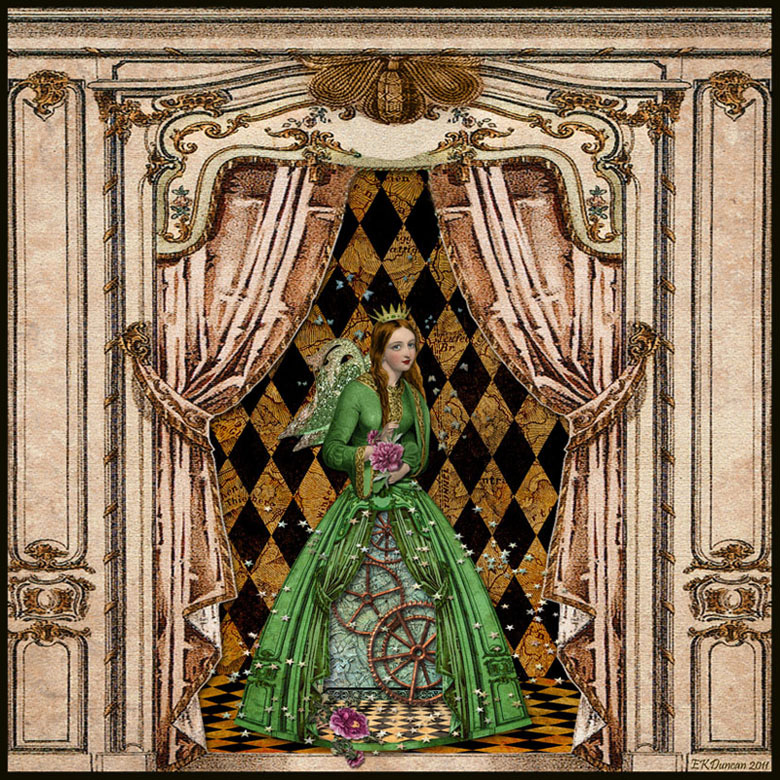 The bright St. Patrick's green, fairy wings and butterflies were in conflict with the Steampunk elements. 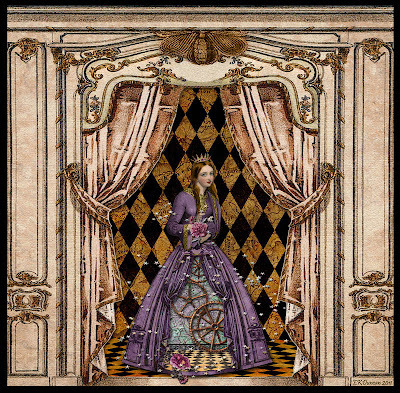 I prefer Steampunk to be in muted colors; which I did with the stage and background. 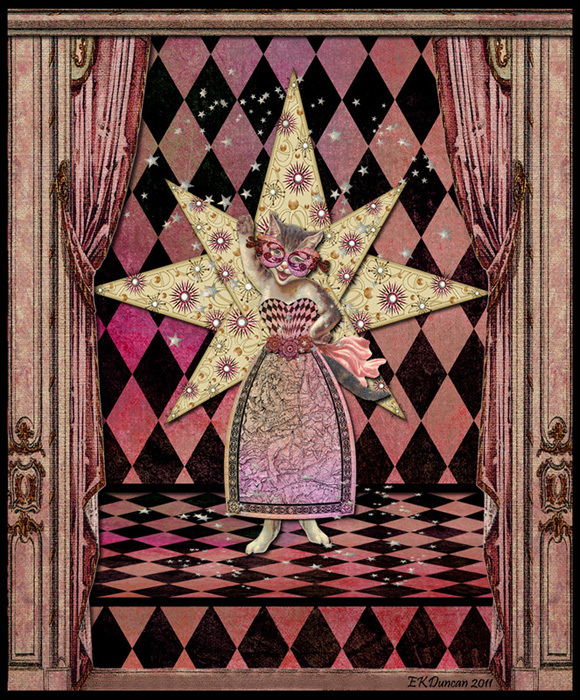 Then of the flip side the "fairy" statment gets lost in all the surrounding elements. I thought this scene was OK but really needed to be reworked. I believe removing the wings, butterflies, and changing her gown color made a world of difference. 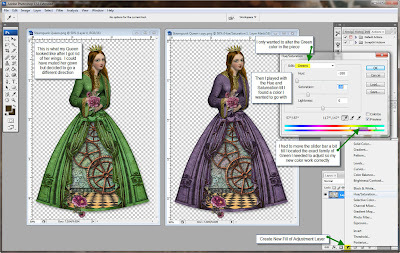 I find this process works best if the original color you are trying to change is either Green or Blue. Yellow and Red are the hardest to alter on a figure that is a flattened PNG or JPEG image since that has a tendency to mess with skin tone, hair color and make-up. Luckily I originally painted her gown green so it made the transaction virtually painless. Unfortunately for me when I originally colored my lady I saved her upper body and then full body as PNG files and somehow forgot to save the PSD file that housed all the coloring layers. 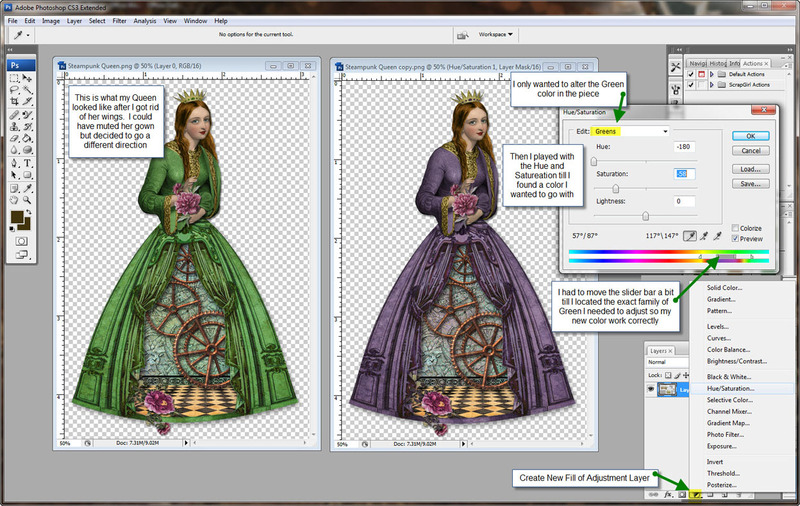 This left me with a "flattened" image and I choose Hue/Saturation as the best way for me to quickly recolor my lady. I would have had more re-colorizing options available to me had I saved my PSD file for the coloring process of my lady. It's one of those instances of "Live and Learn" and one of many mistakes I've made along the way as I learn Photoshop - thankfully the Hue / Saturation trick got me out of this pinch. 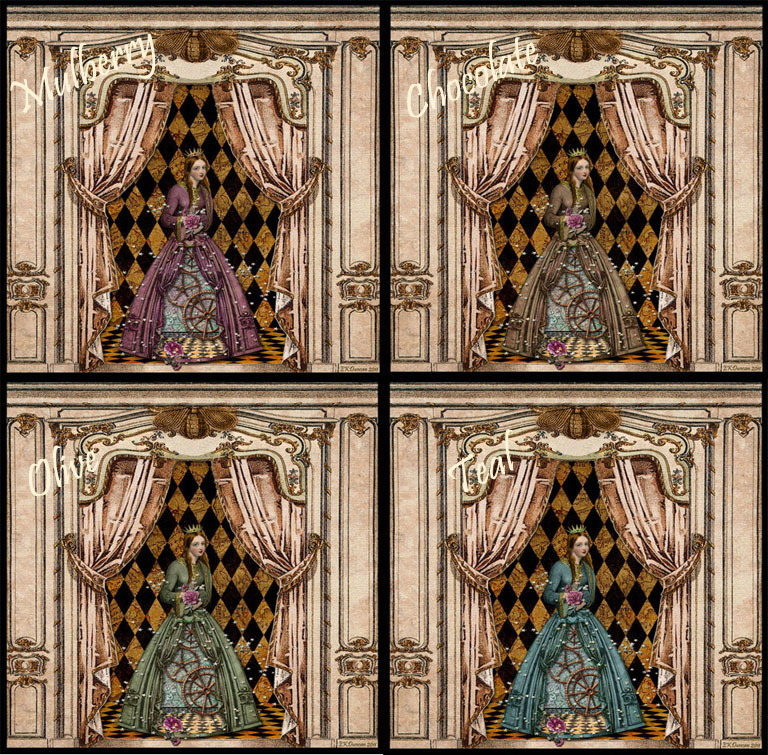 I played around with a few other color options before settling on the plum gown color. These other options were arrived at with just a slight slide of the Hue bar. (I think it's fun to see how a scene can change based on wardrobe color change). but I thought the Plum was the best final choice. 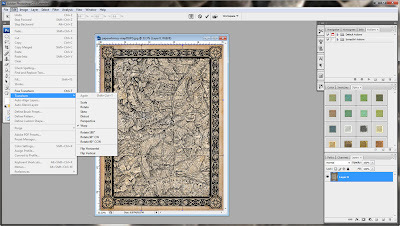 there are ways to change it digitally into something that will work for you. Again, A special thanks to PaperWhimsy for creating great images to play with. Thanks for taking a look at my latest creation. She got a face lift herself and a great woodland scene that's perfect for St. Patrick's Day. I've spent the last few weeks practicing my Photoshop skills and playing with new functions; like "Warp" on the Edit menu just to see some of the creative ways I can alter images. I'm all about using an image to its maximum capabilities and have learned how to recolor them in a multitude of ways and now I'm learning to transform their shapes to give me even greater diversity in how they can be used to create art. this fun scene in Photoshop. PaperWhimsy images in my digital collection to get to this final scene. Most especially the "Warp" feature to create: the skirt, bodice & stage floor. ..."Warp" is my new best friend - giggles. So Here is how I did it! PaperWhimsy and a Victorian paper scrap Kitty. I love the fact that this 100+ year old cat image is living another life in the digital age. "warp" to create the floor of the stage. this image and the "warp" function. 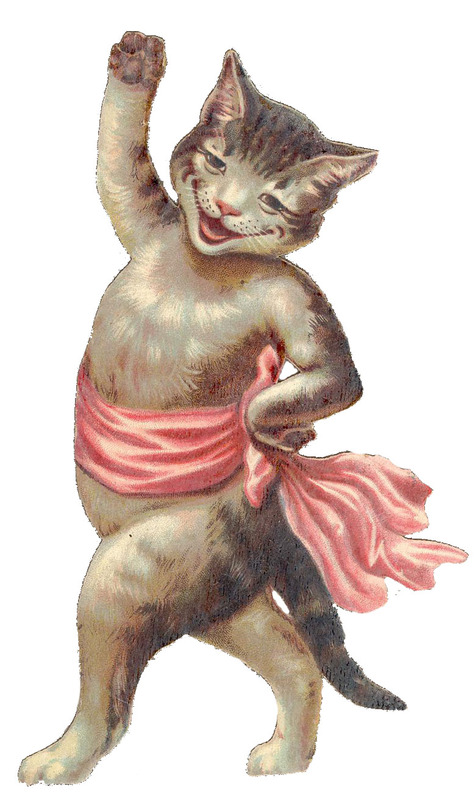 This image was used as the stage to frame my Glitter Kitty. 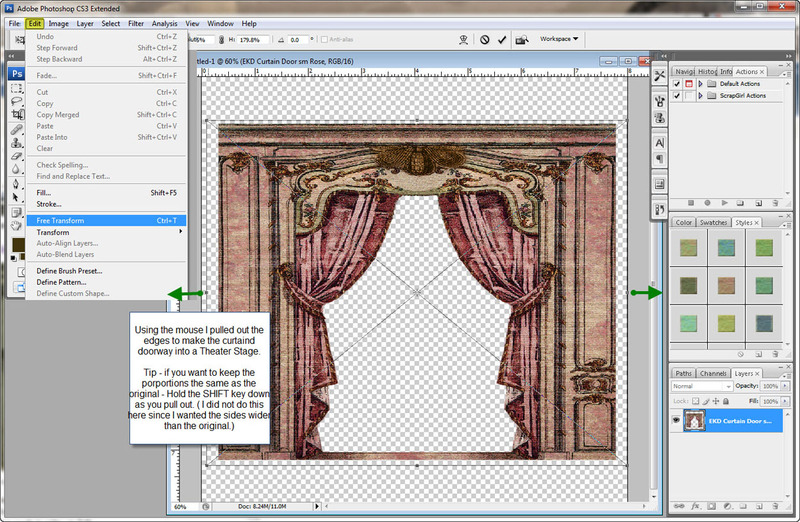 I also split the image in half to make it easier to form my stage curtains. 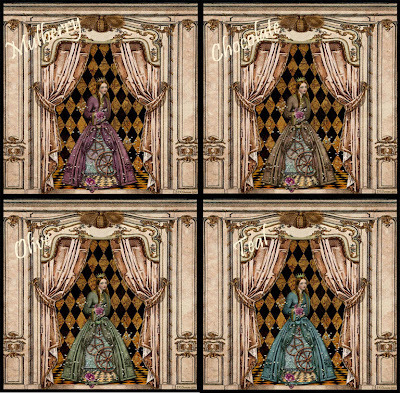 I used the lower red masque. Yes, I altered the color a bit to better match my scene. 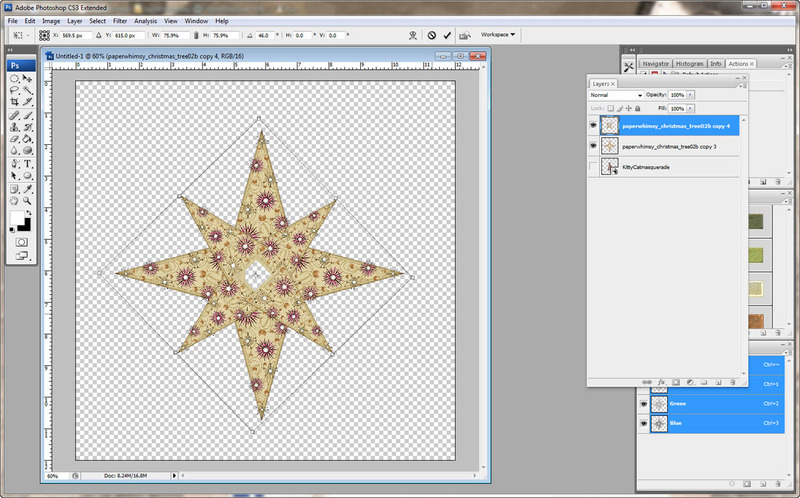 I used the middle section of stars. layer "smooshed" to create the swirl on the floor. 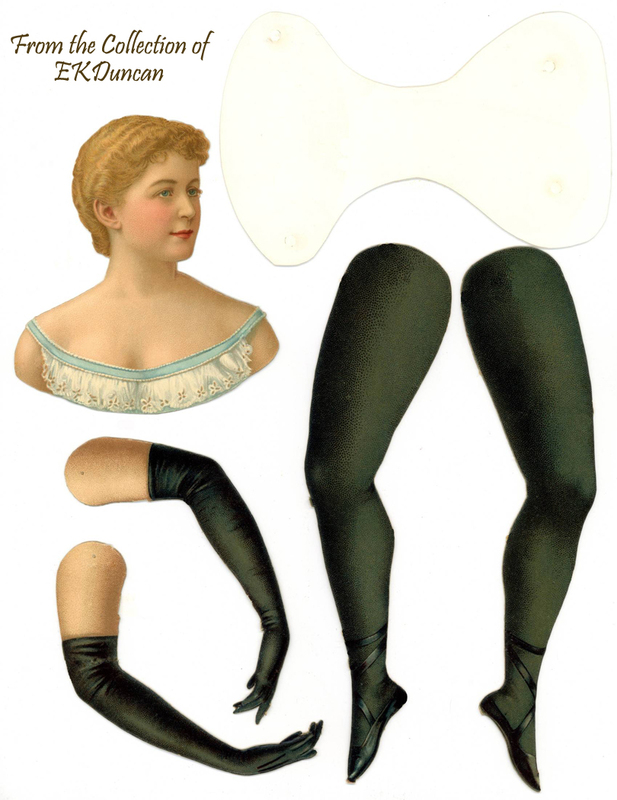 it was used as a "coloring layer" on the bodice, skirt and mask. 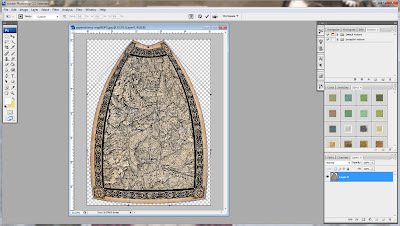 to give this image the shape of a skirt. create the decoration on the skirt waist band. 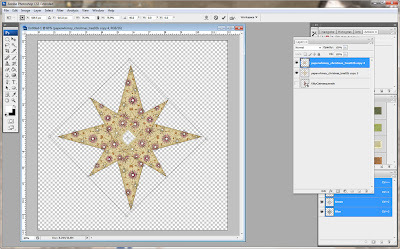 in the center on a top layer in Photoshop. the star shape behind the cat on stage. I made my alterations in Photoshop to create this scene. 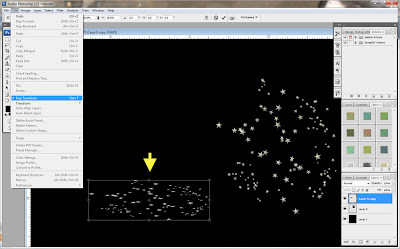 Using "Warp" to Create the Skirt. 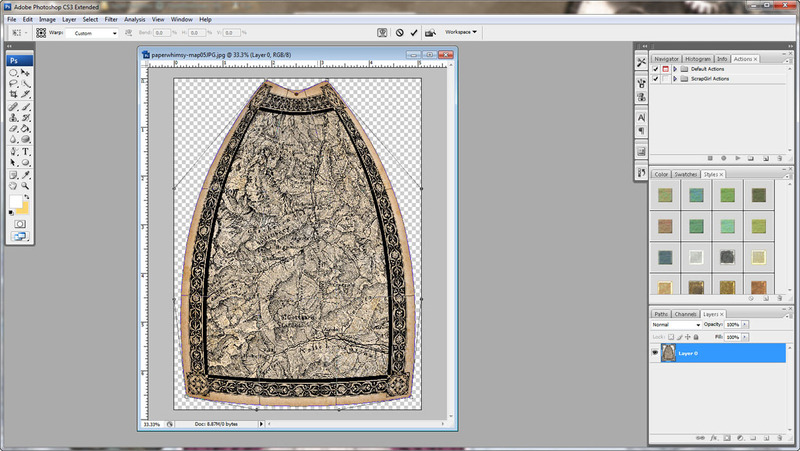 bottom a bit to give a skirt shape to the map image. of the page and move on to my next function. PaperWhimsy - Texture 7 piece. I chose to do this by adding that image to my Pattern selector in Photoshop. 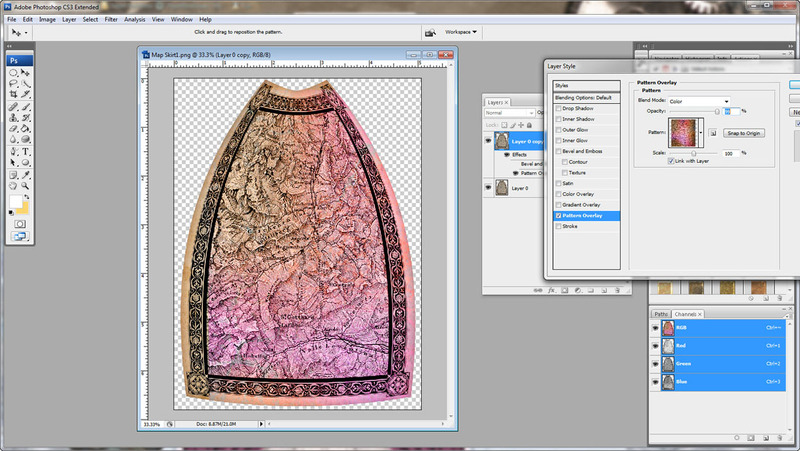 I can easily add it as a "color" layer to my map skirt. I did this by creating a duplicate layer of my skirt. 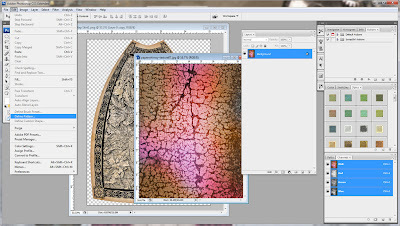 and gave me the option of adjusting the scale or depth of that texture. 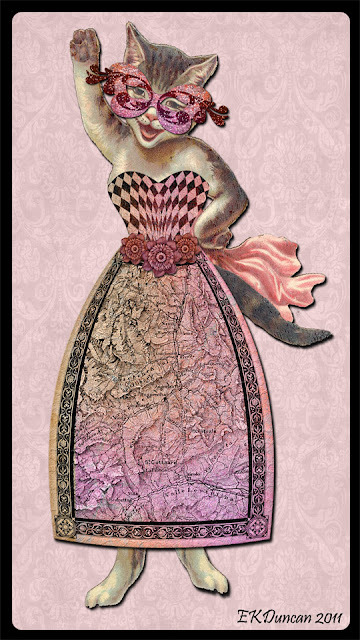 "fit" the bodice shape to the kitty image. each altered and rotated as needed to repose it as seen here. 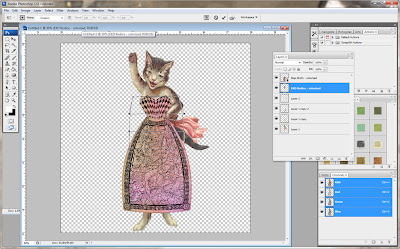 added drop shadows where needed; till she was ready to go on stage. 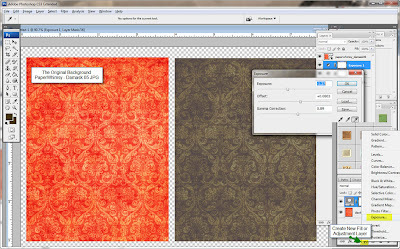 top layer so a bit the damask pattern would show through. 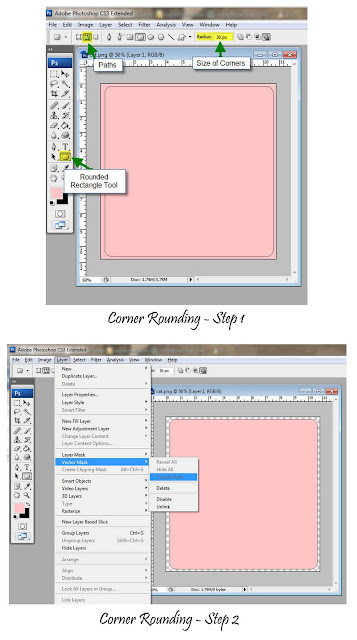 Select the image or layer you want rounded - make it the Active layer on your layers pallet. (this will rename it and unlock it) then try again. these fun PaperWhimsy - Holidays: Christmas Trees 02 PNG elements. 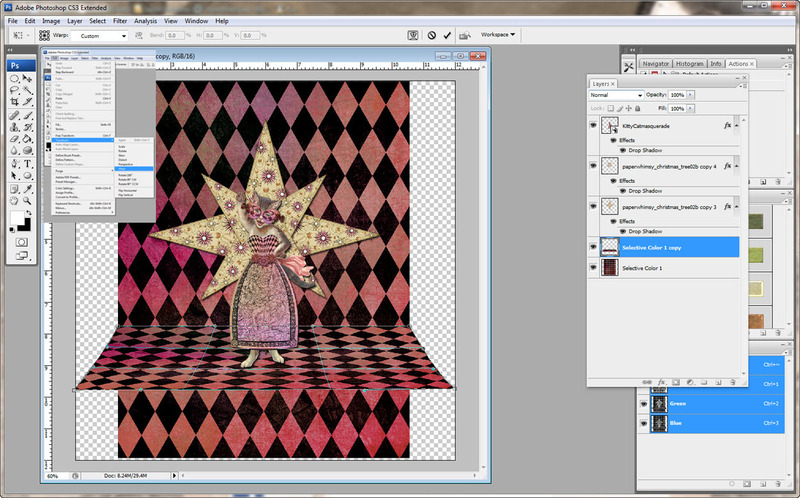 Then I merged all 4 layers into one layer. 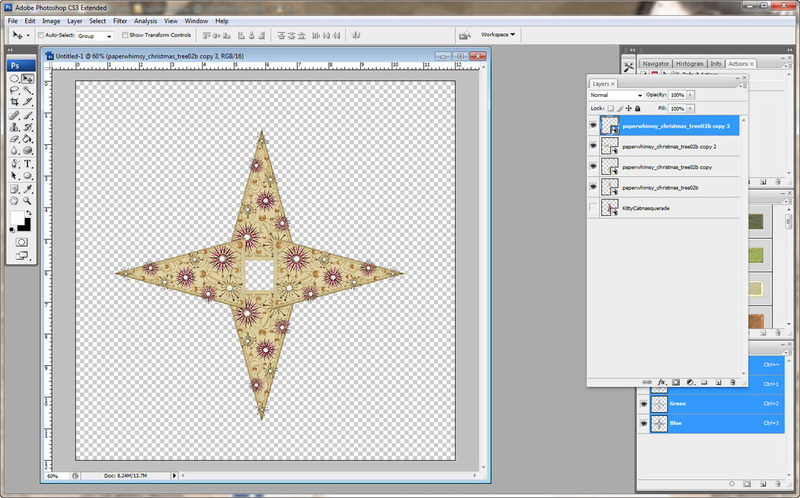 I made the duplicate layer smaller and rotated it to form a star shape. adjustments as needed to build the stage for her. 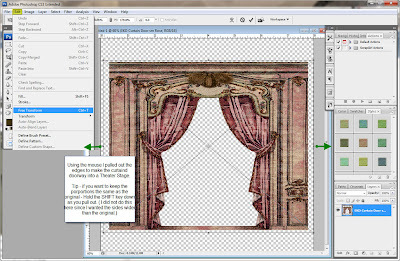 to create the main backdrop and stage floor. I smooshed and used "warp" to create the stage floor. The "smooshing" factor compresses the image making it appear to lay flatter. so the floor appears to be farther away where it meets the backdrop. Then pressing down or pulling down using your mouse. elements look like before being "smooshed"
the altered version to create a star swirl on the floor. It is so much fun to take an object and alter it into something else. an image and create something outside of the box with it. my images and getting so much more bang for my buck on my digital purchases. these types of collages for some time. 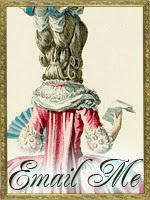 from PaperWhimsy's "Inspire" pages portion of their website. a bit of that nostalgic "two pence coloured" theater look of my own. with great images and fun collages. Check them all out - I know you'll be glad you did! I hope this inspires you to create some fun digital scenes of your own. 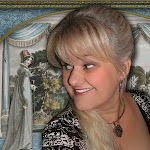 I have a passion for all things vintage... Regency, Victorian, Medieval - European, Egyptian, Celtic, Russian and on and on. 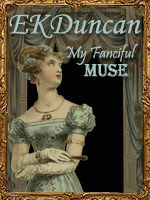 I love reading historical romances and the images of ruffled fashions, enormous draped windows, flounces, ribbons, bows and jewels of all types. I'm also fascinated with a variety of architectural images and elements like ironwork and vintage printers flourishes and ornaments. There are times I can't help but wonder if I was just born in the wrong time period... till I think about how much I would miss things like my computer and certain civilized necessities of life we take for granted today. So since I can't live in another time or place; I like to collect or view things with vintage character. 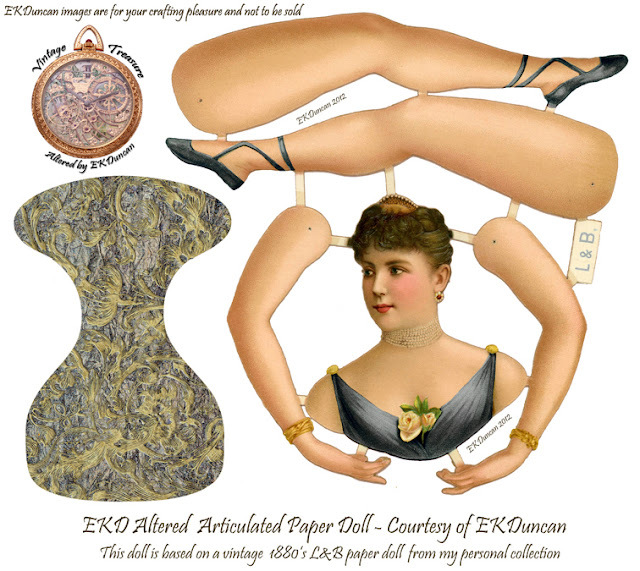 Many of my previous posts are about my antique Victorian paper doll collection. Luckily they do not take up a great deal of space and are easy to duplicate via a scanner, printer or digital computer program. 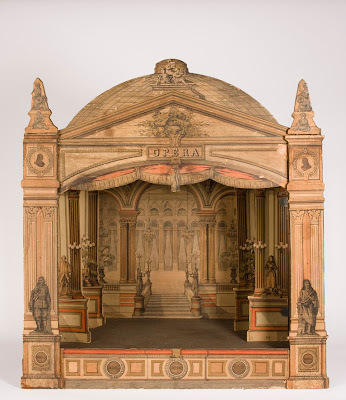 However another of my interests "Toy Theaters" are not easy to collect and therefore I have not been able to house a collection of my own. One of the reasons I wanted to learn Photoshop was so I could create fun digital images that are reminiscent of real Toy Theaters and slowly I've been building a collection of digital images so I could create my own world of these amazing treasures. 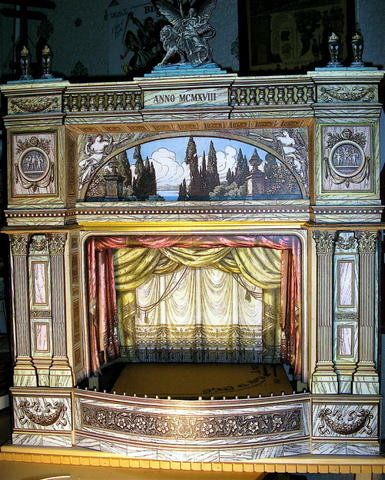 Toy Theaters date back to the late 18th century and were the imaginational playground for many affluent children and adults during the height of their popularity. The best examples are large, lavishly created from wood, metal and high quality screen prints that make up the background scenes and cover the theaters themselves. For those of more moderate means the theaters were smaller and of more common materials. 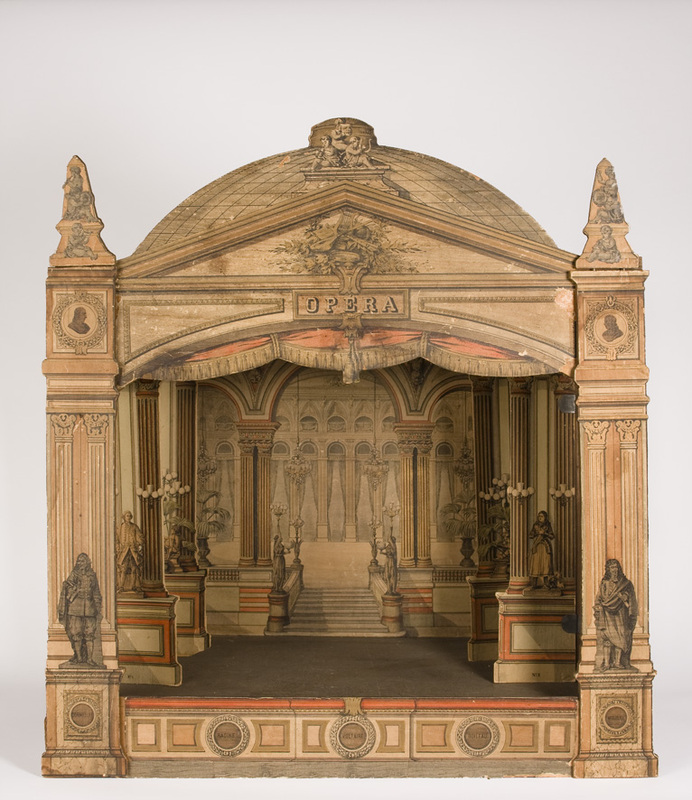 These un-assembled kits were sold at concession stands at European Opera Houses and Theaters and were usually printed on paperboard sheets. 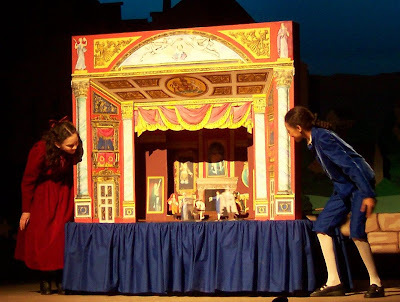 These kits included the theater, several scenes, curtains and the players so you could assemble and re-enact the play or opera at home. The mass produced toy theater kits came as " penny plain" or "two pence coloured". The "penny plain" were black and white images that you could then color yourself. 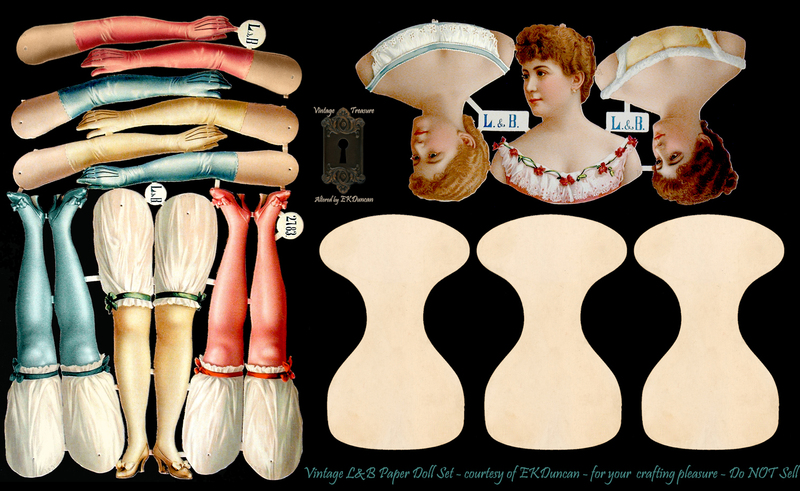 A few of the original makers of these kits are still in business today. 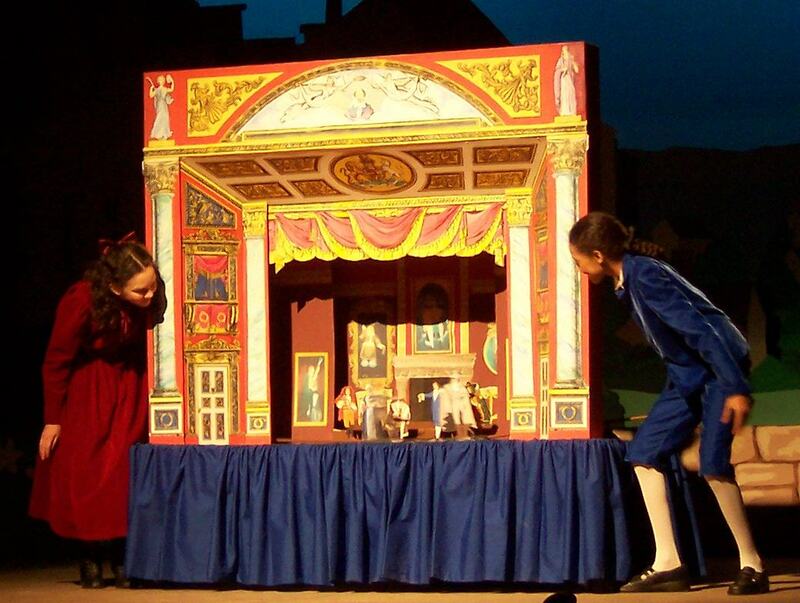 Replicas can be purchase in several sizes, with a variety of scenes, curtains and props available. 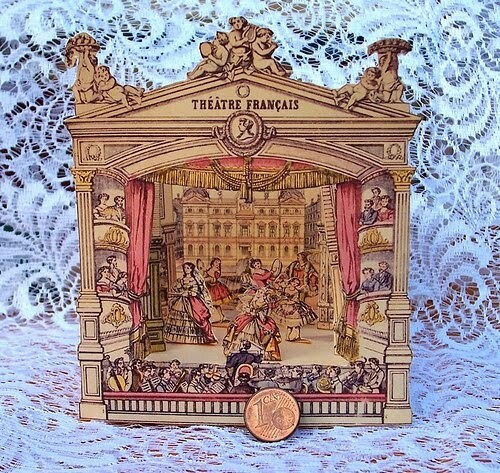 Toy Theaters have also been called Paper Theaters and Model Theaters. 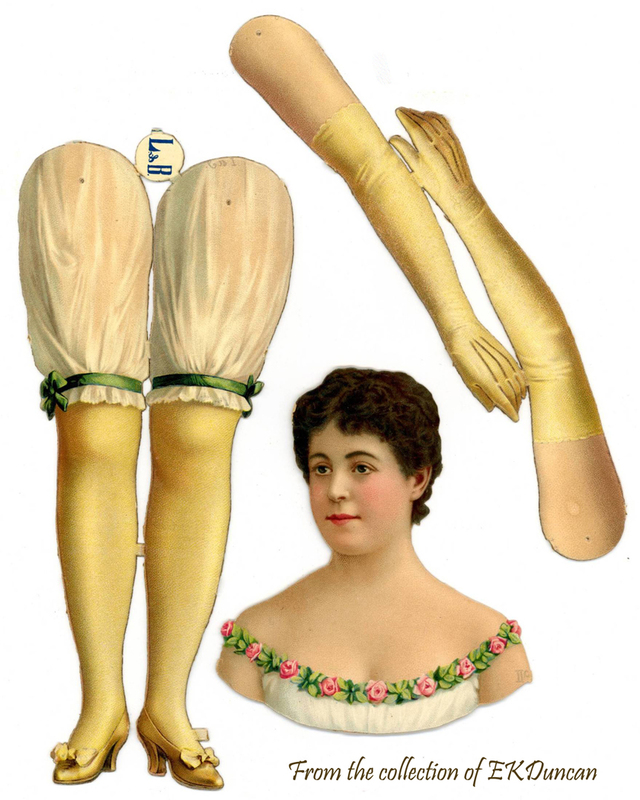 There are several companies that produce a variety of items for the toy theater hobbiest and collector. Such as my favorite...Curtains. Unfortunately most of what I have found available are way too large for me to use in my crafting projects or to scan but I hope that one day soon some of these will be available as digital downloads. 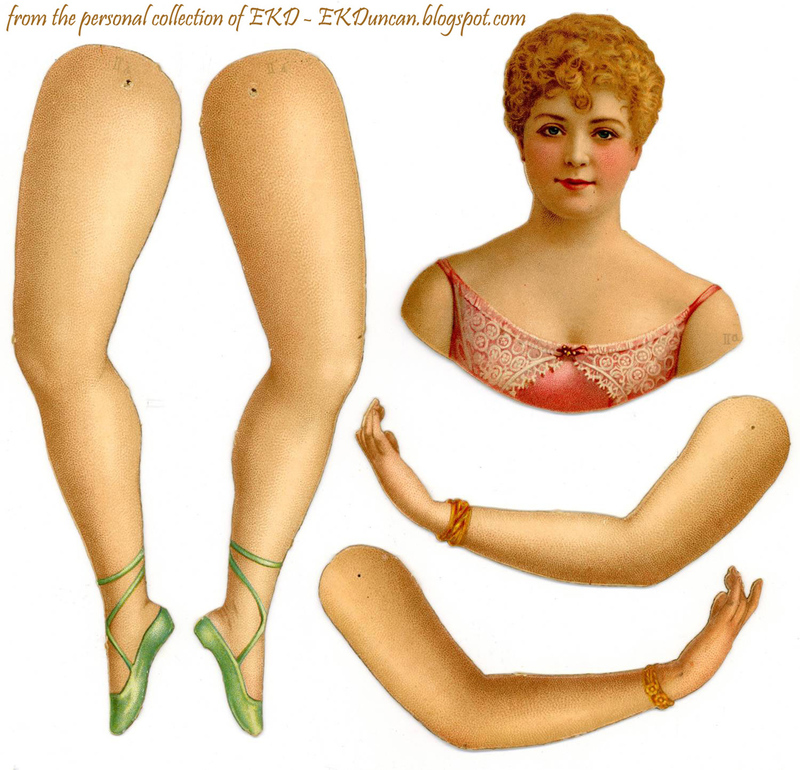 Lucky for me there are other great resources on the web where I can acquire bits and parts of stage pieces to craft with. Most recently I've found several great items at PaperWhimsy.com and will be playing and creating with those in the very near future. I hope you drop back by to see what I've created in the spirit of the Toy Theater.